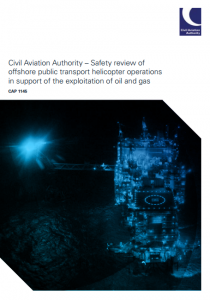 The UK Civil Aviation Authority (UK CAA) have issued CAP1386, their second update to their CAP1145 report (‘Safety review of offshore public transport helicopter operations in support of the exploitation of oil and gas’), issued in 20 February 2014. The first update, CAP1243, had provided an update on the 10 months to 31 Dec 2014. We are pleased to be participating in the work currently undertaken by EASA as part of their Safety Risk Portfolio – Offshore Helicopter Operations. It is clear that EASA is devoting significant energy, time and expert resources into this activity. This work provides an opportunity for real and lasting progress in this area. The majority of the actions and recommendations are now completed and we have identified a number of ongoing workstreams to ensure that we continue to see improvements in offshore helicopter safety. …the focus needs to be on prevention, as opposed to survival, through helicopter design improvements. In this regard, our ambition is to have a defined certification strategy where rotary wing can realistically approach commercial fixed wing safety and reliability performance. …we will continue to work closely with EASA and support all necessary EASA working groups to assist in this objective. In many ways the last comment demonstrates the critical importance to UK helicopter safety of remaining an EASA member State post-Brexit, 13 years since the UK CAA were last a ‘Competent Authority’ able to certify an offshore helicopter. The UK CAA discuss a number of measures previously report in CAP 1243, and subsequently mandated by CAA Safety Directive SD-2014/001 (issued on 21 May 2014). Since then, significant progress has been made in introducing new requirements relating to the compatibility of passenger body size and underwater escape exit (window) size. Further work has also been performed in the areas of EBS [Emergency Breathing Systems] training and extending EBS to flight crew on offshore helicopters. The current Safety Directive (SD-2015/005 issued on 8 December 2015) introduced cover for support to Lighthouse Authorities and, in response to concerns raised by the industry, also introduced alleviation for the carriage of EBS for medically incapacitated passengers. An additional alleviation has been provided against the operating rules for such passengers in respect of life jackets and survival suits. From 1 April 2015, all passengers are now seated next to exits large enough for their body size and are checked by the helicopter flight and ground crews before takeoff as part of standard pre-flight procedures. Since 1 January 2015, all passengers have been required to wear suitable Cat A EBS (CAP 1034 Category A). 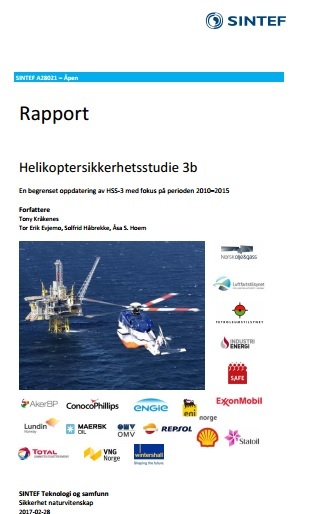 In our previous progress report, we described how this had been introduced ahead of schedule for all passengers on 1 September 2014, and how the oil and gas industry had worked hard to provide the basic training required on EBS usage to all offshore workers. Using Cat A EBS in-water, however, is currently considered by the Health and Safety Executive (HSE) to fall within the scope of the Diving At Work Regulations (DAWR) due to the use of compressed air. Consequently, the training for the new Cat A EBS currently comprises ‘dry’ poolside/classroom training only. 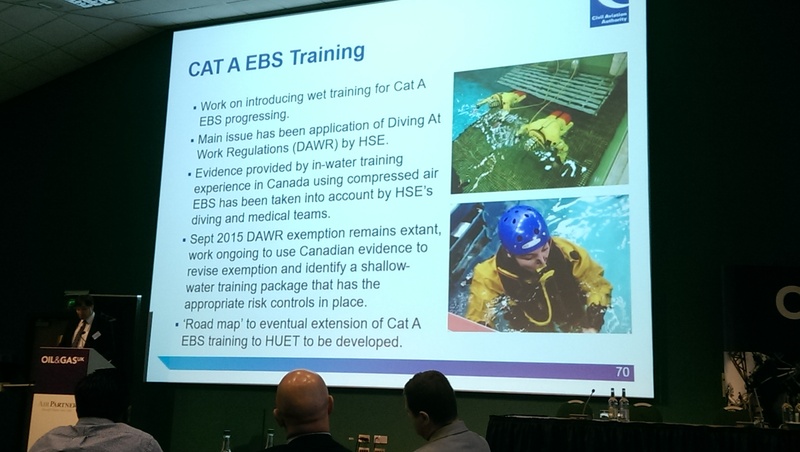 Drawing on favourable experience in Canada, in July 2016 HSE agreed in principle to exempt ‘shallow water’ Cat A EBS training from the DAWR. If implemented, this will significantly improve the fidelity of the current EBS training and will represent a worthwhile step towards the ultimate goal of full in-water training with the new Cat A EBS. A protocol for testing the suitability of the EBS for the flight deck environment has been agreed with the helicopter operators. Three flight crew EBS systems have been approved. EBS for flight crew was introduced into operations on time from 1 April 2016. 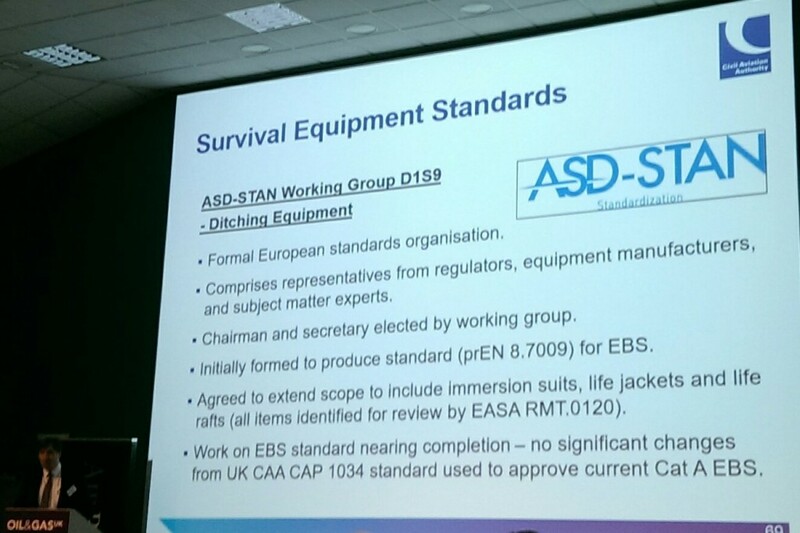 An ASD-STAN working group has been set up to produce a formal EBS standard as a European Technical Standard Order (ETSO), based on the CAA specification contained in CAP 1034, and work is nearing completion. The CAA comment on the recent EASA Notice of Proposed Amendment NPA 2016-01o on enhance survivability matters for future rotorcraft. The UK CAA also accept practical differences with implementing the ‘side-floating’ helicopter concept. the UK CAA does encourage further voluntary retrospective improvements. A number of these measures are included in the Flight Safety Foundation’s (FSF) Basic Aviation Risk Standard for Offshore Helicopter Operations (BARSOHO), launched in May 2015, orientated around a risk bow-tie, containing a number of common and specific threat controls. No doubt the UK CAA will await with interest the International Association of Oil & Gas Producers (IOGP) revision of their Aviation Management Guidelines (currently Publication 390) to enhance survivability. North Sea helicopter operating en-route with automation, with deviation from desired flight parameters. A further joint fixed and rotary wing group has also been initiated at EASA to discuss moving towards Evidence Based Training (EBT) and the CAA will contribute to this work programme. The UK CAA comment on the new Flight Crew Operating Manuals (FCOM) for offshore helicopter operations, an initiative advanced by HeliOffshore. EASA has also specifically identified section 2X.1302 of the Certification Requirements for human factors and this is foreseen in its rulemaking inventory. Pilot AOC training programmes have been modified to take account of instrument scan techniques on complex electronic flight displays. Likewise, the role of the monitoring pilot has been reviewed and implemented by AOCs taking into account extant CAA material written for airline operations. Operator policy rightly identifies the most appropriate use of automation, but pilots must be able to readily revert to manual instrument flying skills when required. The review of revised operator training indicated that AOCs are specifically addressing this need in the flight simulator setting. The CAA will seek to improve the intelligence generated from FDM by working with the industry to improve their programmes. This will be realised in the form of guidance on best practice to support the new European Air Operations Regulations for offshore operations (SPA.HOFO) which will take effect from mid-2018 and which mandate FDM for large CAT helicopters. Oil & Gas UK is also continuing with its project to harmonise procedures for flight safety auditing. The project aims to identify and agree best practice standards for such audits [and] …helicopter operators will increasingly be asked to demonstrate how they meet common standards. 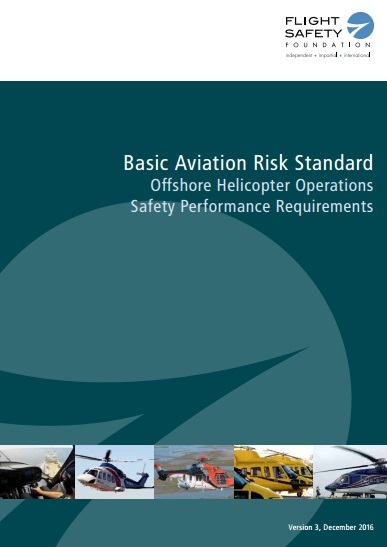 Currently the FSF Basic Aviation Risk Standard for Offshore Helicopter Operations (BARSOHO) is the only contractable industry standard for offshore helicopter operations (as opposed to non-contractable ‘guidelines’). UPDATE 1 February 2017: BARSOHO Version 3, fully aligned with the HeliOffshore SPM, is issued and available. To assist and bring some independence and fresh thinking on this issue, the CAA commissioned Cranfield University to undertake a detailed review of the case for and against improved fire-fighting systems on NUIs. …conducted a bow-tie risk assessment that was generated in collaboration with industry and produced a working paper for OHSAG consideration which focused on the 3 key items. availability of automated helideck fire fighting facilities in relation to the frequency of operations to the helideck. This has generated further debate and review with industry and a revised plan has been drafted to provide an achievable and proportionate solution bearing in mind all the relevant constraints. A safety case provided by aircraft operators that describes in detail the operation (number of flights / day / night operations), aircraft types (including certification standards and configuration), fire fighting provisions, etc, to manage and minimise risk. a) For any decks which do not comply with the requirements for the installation of an automated fire-fighting system, it is proposed to apply an annual limit for landings when the helideck is unattended to constrain overall exposure. In addition, operations to such decks should not take place at night unless a circle and H helideck lighting system compliant with CAP 437 Appendix C is fitted. b) When helidecks without an automated fire-fighting system are attended by personnel trained in the use of the fire-fighting equipment that is available, operations may continue until a cut-off date which will be set following industry consultation. c) From the cut-off date, however, the fire-fighting facilities must meet or exceed the Rescue and Fire Fighting Service (RFFS) provisions of the minimum ICAO Annex 14 Volume II surface level standards for H1 or H2 helicopters as applicable and as referred to in CAP 789.
d) It is proposed that helidecks without an automated fire-fighting system that do not upgrade to the level stated in c) above by the cut-off date will be subject to an annual limit for landings. 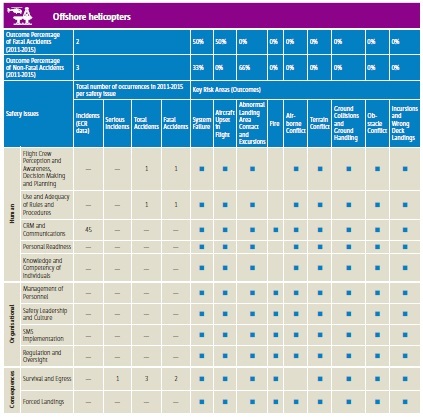 To ensure evenness, the means of implementing the determined safety measures will most likely be through an Operational Directive applicable to all operations conducted on the UK Continental Shelf. In May 2015 UK CAA consulted on the options available to the CAA to assume responsibility for helideck certification (see CAP 1295), something they gave up being involved in after the Brest Spar accident a quarter of a century ago. However, any such change would need legislation that is anticipated as requiring several years to progress through Parliament (and the legislative challenges of Brexit will undoubtedly make even starting on that impractical for several years). The benefits of this initiative were always rather unclear (as the CAA can issue Operational Directives at any time to prohibit or limit operation to specific locations, as they intend to do for NUIs). The UK CAA had considered a scheme whereby they would approve several entities to conduct inspections on their behalf. We think such an arrangement would potentially introduce a greater possibility of inconsistencies, result in less well resourced and less stable inspection bodies and a greater economic burden to ensure standardisation. Indeed the UK CAA have now committed to collaborate with the HCA going forward. The UK CAA comment that they are supportive of efforts to enhance offshore helicopter reliability so as to reduce the risk of ditching in hostile waters. They also comment on the proven CS-E requirements on Critical Parts, implying their are lessons to read across to rotorcraft Critical Parts rules and practices. …reviewed CAA guidance material (CAP 753) and have made amendments [note: yet to be published] to reflect the EASA Certification Memorandum CM-DASA-001, which clarifies the terminology and the alert generation systems to ensure consistency. HeliOffshore… has produced a HUMS Best Practice Guide which draws upon the in-service experience of a number of experts and Helicopter Operators and should assist other countries in applying VHM. The material within this guide complements CAP 753. Organisations…should review their procedures, working practices and highlight any occurrences where contributory factors have resulted in an installation error. However despite the impression that some got from CAP1145, Maintenance Human Factors, while “important”, account for only 20% of airworthiness occurrences. UK CAA analysis shows that 80% of all reports are due to technical malfunction associated with the design or production. 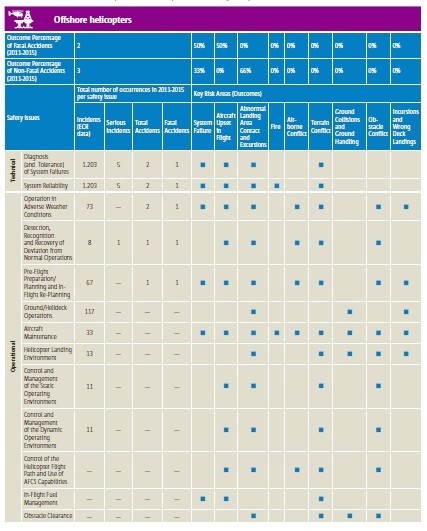 Offshore UK Part M/145 Accountable Managers and Engineering Directors [say] that they are still not all satisfied that all of the OEMs are fully addressing this issue. Further meetings have been arranged with the relevant operators and this will include OEMs at a later stage with support from EASA as necessary. 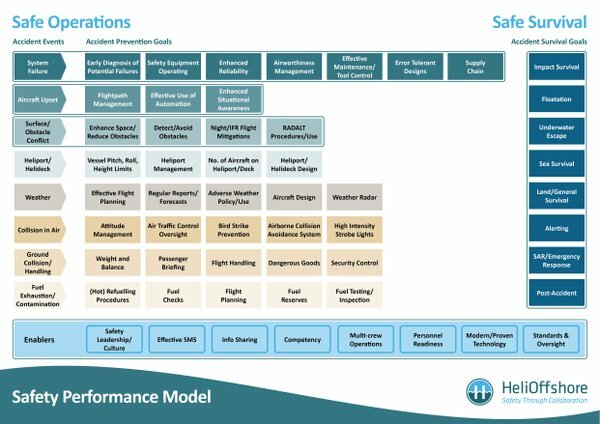 Enhancing aircraft reliability and Resilience is a key work strand within the HeliOffshore Safety Strategy, launched at their 2016 conference. We continue to work with helicopter operators, manufacturers and the oil and gas industry to improve the quality and depth of information available about different aspects of offshore helicopter operations. This information is being used as a precursor to introducing Performance Based Regulation (PBR). We are keen that the existing momentum built over the time since the review should continue. The working relationships established between helicopter operators, regulators, manufacturers, oil and gas industry and employee entities will continue to lead to further safety improvements and the continued growth of a strong safety culture across the offshore industry. This will require continued and significant investment by the industry. UPDATE 26 September 2016: BBC coverage focusing on voluntary implementation. 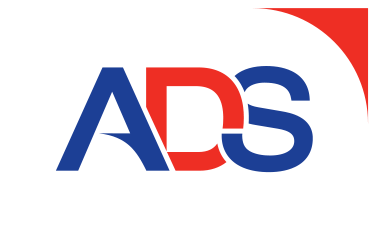 Aerossurance is pleased to be supporting both HeliOffshore and the Flight Safety Foundation in their work to improve offshore helicopter safety. UPDATE 24 May 2017: The Oil and Gas UK Examining Doctors’ Conference discussed the medical assessment necessary for the expected introduction later this year of ‘in-water’ training in use the of Category A EBS on survival courses.